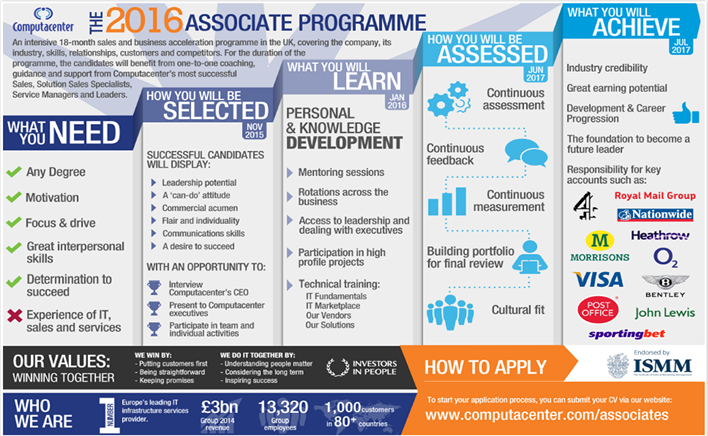 Well, it’s that time of the year again… It’s time to start thinking about bringing future talent on board at Computacenter, via the Sales and Service Associate Programmes. This blog is going to cover what steps you have to take to get onto both Associate Programmes and it will also provide some hints and tips along the way, which I hope will prove to be beneficial for those looking to join the Programme either internally or externally. First of all, if you’re interested in joining the Programme, apply online and send off your CV. Once this has been checked, the next step is to complete a verbal and numeric reasoning test. After this you will need to get in front of the camera. A one minute pitch will be required to explain why you believe you are the right candidate for the role. A tip for this is to be natural, clear and concise. Think about what the role entails and match this to what you have done in the past to impress the assessors. Once you’ve done well in front of the camera, it’s time to interact with some of Computacenter’s employees. There will be a face to face interview with a member of Senior Management and also a current Associate. This will be a competency based interview, so it’s important that your answers are detailed and clearly demonstrate what you have done. Think about using the STAR technique to structure your answers. You will have the chance to quiz one of the current Associates about what they have been up to during their time in the role. The interviews are normally based in one of the regional offices and last around an hour. So you’ve had your time in front of the camera and you’ve really impressed a member of Senior Management and an Associate, pack your overnight bag as you’re off to two day Assessment Centre in Hatfield. You won’t find a better assessment experience at many other companies. On the first night you have the chance to sit down and have dinner with members of our Leadership team. I know that it sounds obvious but interact with everyone there and think carefully about what questions you ask and answers you give – you are being assessed from the outset. Wake up, have your breakfast and head over to the head office in Hatfield for the second day of assessments. This is the opportunity to really have your time to shine. Throughout the day you have the opportunity to work in a group and provide a sales pitch, there is a panel interview, the opportunity to interview a member of the Leadership team and finally you will have five minutes at the end to leave a lasting impression with a “why me” presentation. Come prepared, be engaged and try to enjoy the assessment centre as much as possible. Be warned however, it does take it out of you. After my assessment last year I woke up at 3am on the sofa still in my suit. Once the assessment centre has been completed, those that are successful will get a phone call from a member of the Leadership team offering you the job. You can then sit back and relax until the Associate Programmes start in January. If you’re looking to apply this year, I hope that this has helped and for those of you who may be interested in how the assessment process works, I hope that this has provided a good insight. Even if you have friends or family, which you may think would like to apply, please see the link below to the application page. Next month we will hear from Jon Newsham, who will discuss what life is like as a Service Management Associate. Thank you for reading. If you have any questions around applying for the Programme or the Programme in general, then please don’t hesitate to drop me an email.